Grateful thanks are due to the members of the Select Vestry of Garvaghy Parish for their backing of this project and to Banbridge District Council for the grant towards the printing of this book. Many people have helped the authors in this undertaking by supplying information, both written and verbal, about the locality. Most appreciated was the personal description of Garvaghy Primary School provided by Mr J Kerr who was Master from 1939 to 1945. Individual historians and staff in a range of establishments were also most helpful in providing sources for research and in pointing the authors towards further avenues of investigation. Of these, mention must be made of Dr J R R Wright of Banbridge, Co Down who provided much valuable help. Thanks are also due to Mrs Pat Musgrave and Mrs Lorraine Thompson who made an important contribution by proof reading the manuscript. It is a great privilege to have been asked to write a foreword to "The Story of Garvaghy Parish" and to commend it to others. The special quality of the book is apparent even from its title. The book tells the unique story of a small rural parish, however, not only of its buildings but also of a pilgrim people who faithfully responded to and served God. The Rev Paul Thompson served as a faithful priest, pastor and teacher to the people of Garvaghy and now recollects some of his own memories with those of others as he presents this interesting historical account of the Parish. Along with Messrs Jack Kerr and George Musgrave the Rev Thompson takes his readers on a journey which begins with God's people many years ago in the Celtic Church and continues with those who faithfully serve Him today and in the years to come. I pray that those who read this book will be greatly inspired and encouraged to serve God within this and other Parishes. Important events and dates that are significant punctuate the story of any people stretching back over a long period of time. In the case of Garvaghy Parish the year 1999 marks the 300th anniversary of the present Parish Church. The worshipping community and wider society of the Parish existed long before 1699 and by God's grace will continue to exist long into the future but 1999 does stand out as an important anniversary. This provided an impetus to examine the past, to look at where we have come from and to see how events and people have shaped the Church and community making them what they are today. The name Garvaghy comes from the Irish, Garbh Achadh (the Rough Field) with the Parish of the name being situated to the east of Banbridge with a length of 6 miles and a width of 4 miles at the extreme points. The highest point is Carnew Hill at 753 feet while Gransha Fort on the eastern boundary is 695 feet. Garvaghy Hill, although lower at 671 feet, has a better view. The Parish is an area of farms and scattered houses with the main area of human settlement being the village of Waringsford, formerly known as Mill Town. The Parish Church is located about 1 mile from the village, near to which is Garvaghy Presbyterian Church. The story of the Parish of Garvaghy is one that stretches far back in time. 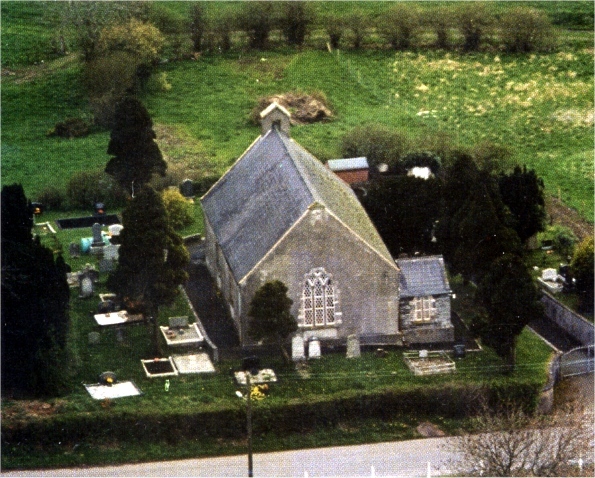 The Parish Church is part of the Church of Ireland, a parish of the Diocese of Dromore. This book is not, however, only the story of a Church building, or of the people who worshipped there, but of a whole community, rich in its diversity, its past and its potential. The size of this volume, however, means that this story can only be told in part. It is hoped, though, that it serves to introduce people to their past and to the often complex but revealing story of the present day Churches and community of the Parish of Garvaghy. In the year 432 AD St Patrick landed at Saul in what is now Co Down and began his mission in Ireland. It is probable that he was not the first Christian missionary in the country and that there were already existing small and isolated groups of Christians founded through trading contacts. It was the mission of St Patrick that sparked a flame that spread in a relatively short time throughout the entire island. The early Irish Church did not encounter the opposition it did in other countries. This may have had something to do with the particular form of the Christian faith brought to Ireland. There are some historical, theological and legendary points indicating that the main influence on the early Irish Church came from Egypt and the Christian East generally rather than from the Latin West. Egyptian Christianity and subsequently the early Irish tradition were of a more mystical inclination and may have appealed to the native religious feeling in Ireland. In these early centuries the Church was organised in a completely different way to the Church of today. The primary figure in Church organisation is the Bishop who presides over a fixed geographical area known as a diocese. The Church then had a monastic basis rather than a diocesan one. This meant in practice that the Abbot at the head of a monastery ruled the Church and that the Bishop was under the authority of the Abbot. There are many instances of monasteries where an Abbot had several Bishops on his staff. The Abbot was primarily an administrator while the Bishop was an evangelist and a liturgical figure. There were no diocesan boundaries, as we know them today. A major monastic settlement was that of Dromore, founded by St Mocholmog (Colman) in the 6th century. There are records of Coarbs (or successors) of Mocholmog from 953 to 1068. The smaller Church settlements in the countryside, such as that of Garvaghy, were not parish Churches as we know them today but merely smaller monastic communities founded probably by members of the larger ones. Trouble came to the area with the onset of the Viking raids. The first known attack on Ireland came in 794. In the year 840 the Vikings are known to have sailed into what is now Belfast Lough and up the River Lagan as far as Magheralin. There they established some sort of fortified base and made incursions out from it. It is not known if they penetrated as far as the Dromore area at this early stage. In the next century, however, Bassett writes that the monastery at Dromore had secured some considerable wealth and that the Vikings plundered it on several occasions. The earliest known date for a Church in Garvaghy is the 9th century. The evidence is provided by a slab of rock with a cross inscribed upon it, which was found by the late Mr James Ferguson while digging a grave. The rock tapers to one end indicating that it was designed to be placed in the ground almost certainly as a grave marker for a member of the small monastic community. 'The form of the cross is of a long upright with a circle around the crossing of the horizontal lines, which is what is termed a Celtic Cross. The slab and cross have been examined by the staff of the Ulster Museum in Belfast who dated it to the 9th or 10th century. The implication of this find is that although the present Parish Church dates from 1699 there has been a Church on the site from somewhere in the region of 800 to 1000 AD. It would have been a small monastic community whose life would have revolved around a daily offering of prayer and the ministering to the spiritual needs of the people of the area. It would have been natural for these early Church settlements to be surrounded by a circular earth rampart, inside which would have been the Church building and the monastic dwellings. The rampart kept out wild animals and provided security during the night for the cattle and other animals owned by the monks. across the centuries from a circle. The site may well have been a natural mound that has been accentuated through time to the present height above the surrounding fields especially to the west. That there is a stream nearby is typical of early Church settlements, as this would have been necessary for a water supply for both monks and animals. Near to the Parish Church and still within the Parish is the townland of Killaney. All the evidence available indicates that this is also an ancient ecclesiastical site although it is not possible to give it a date. The name Killaney in Irish has at least two possible meanings. One is The ivy-covered Church and another is The Church of St Ethna. The townland has also been known locally in the past as The Townland of the Graveyard. The site of the Church and Graveyard indicated by the names above is on fields belonging to Killaney House and is known as Strong's Rocks, so called because of the name of a previous owner of the land. The site consists of a number of rocks of varying sizes. It is believed that it was an ecclesiastical community of some importance in the early Christian period. It may have been a quite separate monastic community to that of Garvaghy or it may have been an original site that was abandoned with the community moving to found a new site at Garvaghy. The organisational pattern and spirituality of the early Irish Church was quite distinct from the rest of Western Christendom having more in common with the traditions of the East. In the early Middle Ages pressure grew on the Celtic Churches in Ireland, Britain, Brittany and Spain to conform to the established Western norms. Later in 1216 King John of England directed that no Irishman be elected bishop. This ensured that whatever the feelings and beliefs of individual priests and laity the now English and Western leadership of the Church could determine the future direction and form of the Church as they wished. In the new pattern of Irish Church organisation set out at the Synod of Kells in 1152 Dromore was not chosen as an Episcopal See and no Bishop of Dromore is mentioned as being among those who did fealty to Henry II in 1172. The first mention of the diocese of Dromore is when a Bishop of lveagh (Dromore) was a witness to a charter of Malachy, Bishop of Down concerning the monastic site of Nendrum in 1197. It is probably the case that the diocese of Dromore (or Iveagh as it was known then) was established at the Synod which met in Dublin in 1192 under the presidency of Matthew O-h-Enni, Archbishop of Cashel and Papal Legate. Things were not only changing on the ecclesiastical front but also in the wider sphere too. John de Courcy had led the Anglo-Norman conquest in Ulster but was ousted by Hugh de Lacy in 1203 who became Earl of Ulster. In 1316 his lands passed by marriage to the De Burgh family. William de Burgh was killed by his own servants in 1333 and after this the baronial title to the lands of Down passed to the English Crown. The Irish Chieftains who from the beginning had contested the occupation of the country were the O'Neill, Magennis, McCartan, Kelly and Macgilmore clans. It was the Magennis Clan who ruled the territory of Iveagh including the lands of Garvaghy. In the 13th and 14th centuries the Diocese of Dromore was one of the smallest and poorest in Ireland. In the Taxation of 1302-06 there is no mention of a Dean and other dignitaries on the staff of the Cathedral. The presence, however, of an Archdeacon in the Diocese is recorded. In the 15th century the Church as a whole in Dromore Diocese was badly neglected. In 1487 the Archbishop of Armagh wrote to Henry VII saying that the See is void and, desolate and almost extinct. Most Bishops who held Irish Sees lived in England and had little concern for the state of the Church. This was carried to such an extent that from 1480-83 Yvo Guillen, a canon of St. Malo in Brittany, France, was Bishop of Dromore, in title at least. Collect and dispose of rents and all tithes of lands and parishioners of... Garwaghadh [Garvaghy] annexed to the Bishop of Dromore's table and due to the Archbishop [of Armagh] during his custody according to ancient and laudable custom. gone to the Bishop of Dromore. It is recorded that in 1428 the Archbishop let his lands in the Parish of Garvaghy to a man called Gyllabrony McKewyn and in 1431 to Philip McKewyn. The Parish Church of Garvaghy would appear to have been near to a main north-south transport route echoes of which remain in local stories and folklore. The townland of Shanrod near to the Parish Church derives from the Irish for old road. The modern roads in the area follow the low ground but the minor road north to south in the townland follows a ridge to a crossroads on the summit of a hill in Fedany. This would be the old road of the townland name. If it is followed down the ridge it would cross the river Bann at what is now Katesbridge in the townland of Shannaghan. This crossing point was protected by a Norman motte situated on the north bank of the river. In the northwards direction the old road would seem to have led from Fedany Hill down what is now Shot Lane, across Garvaghy Church Road and across Enagh Road and down to Aughnaskeagh. Its direction after that point is uncertain. That Shot Lane is part of the old road is indicated by the close fitting of the lane within the landscape and also by the local tradition which spoke of Shot Lane as being in former times part of a Belfast to Dublin road. Given however the quite recent origins of Belfast it is more likely that the northern end of the road was Carrickfergus, a more ancient and important location. Another local tradition speaks of a road from Armagh to Downpatrick passing through the townland of Tullintanvally near to Katesbridge. It could have been the case that the two roads intersected each other in the region of Katesbridge and the fortified river crossing. Similar routes are thought to have had their origin in the post-Patrican era or earlier. One such ancient road led from Dunseverick Castle on the north coast of Co Antrim to Tara the seat of High Kings of Ireland. It is certainly possible that the road of Shanrod is of similar antiquity. Such a road, following the higher ground, could have been used for centuries until there was the ability to construct more direct routes across what had previously been uninviting boggy lowlands. It is therefore feasible that the Shanrod/Shot Lane route could have been established in the pre-Christian era (it is near to a Standing Stone), been used in the early Christian period (it is near to Garvaghy Church with its 9th century site date) and been utilized in the Middle Ages (its crossing of the river was guarded by a Motte). During the years of Reformation the Church throughout Ireland was in a state of upheaval. The aim of the reformers was to restore the Church to what was seen as a purer and more Biblical pattern of belief and worship. The Church was still directed from England, which meant that the Reformation had a very English tone to it. A major theme of the reformers across Europe was that the Church's worship and Scriptures should be in the language of the people instead of in Latin. In Ireland, however, due to English policy the Liturgy and the Scriptures were translated into English not Irish, the language of the vast majority of the people. This was a great failure of the Reformation. From this time the ancient Irish Church was divided. The Bishops and a minority of the laity went with the process of Reformation and a majority of the laity and a number of clergy preferred to stay with that part of the Irish Church which remained in communion with the Pope. It is from this era and division that the Anglican (Church of Ireland) and Roman Catholic Traditions in Ireland derive in their modern forms. The Reformation however was also a time of continuity. No new Church was formed; the old Church was reformed. The three-fold orders of Bishop, Priest and Deacon were maintained. The Daily Office was still recited and the Sacraments were still celebrated. In 1546 the Parish of Garvaghy was assessed at 3 marks, under the title of the Vicarius de Garvagh, at the taxation of the Diocese. This rate was an average one for the era. At this time the Bishop of Dromore was the Rt Rev Art Magennis of the ancient Magennis family. He was Bishop of Dromore from 1540 to 1575. He accepted Royal Supremacy in 1550 when he was pardoned for having received a Papal provision. Despite this he was still recognised as Bishop during the reign of Queen Mary. Each of these events touched the locality of Garvaghy but their origins lay in other places. In 1603 Hugh O'Neill, Earl of Tyrone, surrendered to Lord Mountjoy who led the English government's army in Ireland. Later in 1607 he and other Ulster noblemen left Ireland for mainland Europe. This has become known as the Flight of the Earls. James I then took their lands and began a programme of colonisation. This action initiated in 1609, known as the Plantation, led later to the war of 1641. The Irish, one quarter of whom it has been estimated still belonged to the Church of Ireland in the early 16th Century were driven off their lands to make way for the English and Scottish settlers. Most of the Scots were Presbyterian and so another religious dimension was introduced into Ireland. War finally broke out in 1641 between the Irish and the English and Scottish Settlers and much bloody conflict was seen throughout County Down. The Irish forces attacked the Churches of Garvaghy, Dromara and Magherally. The buildings would almost certainly have been thatched and so would have burned easily. In Dromore the town, Cathedral and Bishop's Palace were also attacked and largely destroyed. Narrow Water Castle was captured and Sir Con Magennis took the castle and town of Newry. The Vicar of Garvaghy Parish at this time was the Rev Patrick Dunkin who had only a short time previously been married by licence in Lisburn, 14th April 1640 to Elizabeth Tompson. At the same time as being Vicar of Garvaghy he was also Vicar of Donaghmore, Co Down and it was here that he was living in 1641. He and his family were driven from Donaghmore in the rebellion but later he petitioned the crown for restoration which was granted 26th September 1660. Despite initial success throughout Ireland by the Irish forces it was the English forces that in the end won the war. These were not the forces of the King but of Cromwell and Parliament who had been victorious in the English Civil War. With the execution of King Charles I and the abolition of the monarchy in England, the country was proclaimed a Commonwealth with Oliver Cromwell as the Protector. He at once set about subduing Ireland with considerable force and implemented his creed in England and Ireland with his weighty authority. Cromwell instituted an Inquisition of 1657 to determine the state of the Irish Church. It was reported that in the case of Garvaghy the remaining walls of the Church were no more than one yard in height. The building was not repaired and no more is known of Garvaghy until the end of the century and the building of the present Parish Church. In the case of Garvaghy and other similar Churches the new government decreed that the money which in times past had gone to the Rector and the Bishop would now be given to the government. The Inquisition of 1657 reported that in the past the Rector or Prebend had received the tithes of ten townlands while the Bishop received those of four. It was the money from these fourteen townlands that was to go instead to the government. Oliver Cromwell carried out his own reformation of the Irish Church. A Presbyterian settlement was forced upon the Church, the Book of Common Prayer was banned, bishops were sacked and the great liturgical and spiritual legacy handed down from the early Irish Church was neglected and abandoned. Many senior clergy managed to have a good life in an enforced retirement but other faithful bishops and priests waited patiently for a restoration and persisted in using the Book of Common Prayer in secret, risking imprisonment by doing so. One of the latter was a priest named Jeremy Taylor who would later be appointed Bishop of Dromore Diocese. This all was to have a local implication for Garvaghy and surrounding districts for the first Presbyterian minister to preach in the area did so in St. John's Parish Church, Dromara, which had not been as badly damaged as that of Garvaghy. With the restoration of the monarchy to the English throne in 1661 the Irish and English Churches reverted to the episcopal tradition again. An English priest, Jeremy Taylor, was appointed Bishop of Down, Dromore and Connor on the 21st June 1661 and remained there until his death in 1667. He had been born in Cambridge and baptised in 1613. His most famous books are Holy Living and Holy dying. He was instrumental in rebuilding many of the Churches of the three dioceses ruined in the War of 1641. He died in Lisburn 13th August 1667 and was buried at Dromore Cathedral. He was a faithful priest and bishop, a liturgical scholar of the first rank, a person of great spiritual wisdom and a man who cared deeply about the Irish Church. A revision of the Prayer Book was carried out at this time and a new Book was published in 1662. Presbyterian ministers who had been appointed to parish Churches during the Commonwealth era were given the choice of accepting Episcopal ordinations or losing their positions. In Dromore Diocese, as elsewhere, some took the first option and some the second. Garvaghy Parish between Restoration and Rebuilding. In the year 1679 the Rev Samuel Hudson was appointed to the Vicarage and it was recorded that at that time the Church was in a ruinous condition. Upon leaving Garvaghy in 1685 he became Vicar of Devlin, in the Diocese of Meath, where he remained until 1709. The Rev John Wetherby who had been born in Eaton, Cheshire, followed him in Garvaghy. During his ministry in the area from 1686 to 1694 he was Vicar of not only Garvaghy but also simultaneously of Dromara and Magherally. This situation was a natural result of the ruinous state of the Churches and the slow recovery of the community after the 1641 war and Commonwealth repression. The year 1699 is an important one in the story of the Parish of Garvaghy for it was in this year that the present Church building was built and consecrated. No details are available about the rebuilding of Garvaghy Parish Church but it is thought that the remains of the older medieval walls were used as the foundations for the new ones. The Vicar at the time was the Rev William Johnston who had been Instituted in the parish in 1694 and remained there until his death in November 1716. In a Visitation of 1694 he was warned to reside in the Parish within three months and later after the rebuilding it was recorded that he did indeed live in the Parish while carrying out his duties. Throughout this period Garvaghy Parish was still linked with Dromara and Magherally which also had ruined Churches and small numbers of parishioners. From 1615 to 1765 the main responsibility for maintaining the roads of Ireland lay with the Parishes and for a further thirty years Northern Irish Parishes continued to look after byroads in their areas. This was the position in Co Down and so while Garvaghy Parish Church was being built and the episcopal tradition being restored after Cromwell's Commonwealth the work of road maintenance would have continued. This was a vital work because good means of communication were needed if the country was to prosper and goods were to be transported to where there were buyers. The Irish legislation regarding road maintenance was based on English laws of 1555,1563 and 1576, which required the constables and Churchwardens to appoint two people of the parish, annually on the Tuesday and Wednesday of Easter week, to be in charge of road works. They also indicated six days on which any necessary work was to be carried out, the six days having to fall before 24th June, the Feast of St John the Baptist. These days were then announced in Church on the Sunday after Easter. To carry out the work each occupier of land that was ploughed or every person who owned a plough had to provide a cart, with horses and two men to accompany it as well as two further men with tools. Each householder, cottier and labourer, except for servants who were hired by the year, had also to work on the roads for the six days or if unavailable had to provide someone else instead. On each of the six days eight hours work was required. The Directors of the work were permitted to obtain material for the maintenance from within the parish and if any payment was necessary it was to be met by the parish. Over the 150 years that this legislation was in place the requirements were changed and adapted to meet new situations and circumstances. When the legislation was abolished the Irish House of Commons permitted vestries in Ulster to raise money from landowners in order to maintain byroads in the parishes. The vestries of the parishes continued exercise this responsibility until 1796. The parishioners of Garvaghy started the 18th century with a new Church building. This era was one of many developments yet at the same time it also raises many questions the first of which concerns the identity of the family or individual who provided financial backing for the building of the Church. It is not possible to be certain but it is likely that the Waring family fulfilled this role. Henry Waring, fifth son of William Waring of Waringstown, built a mansion house in the parish on the mill quarter of Tullyniskey. This house occupied the ridge of land beyond the river plane opposite Waringsford village. The locality came to be named after both the Waring family and a ford over which the road to the house passed. Before this time the area was known as the Milltown and it is described as such in a deed of 1622. Henry Waring died in 1716 and the name Waringsford is first recorded in 1718. His eldest son, Henry Waring Knox, was born in 1768. In 1785 he joined the 13th Dragoons and in 1789 the 9th Regiment of Foot. Like his faAther he was a keen hunter and kept a pack of hounds at Waringsford. He was elected to the exclusive Down Hunt in 1796 and it is recorded that he entertained John Peel at his house at Waringsford. He is reputed to have enjoyed life to the full but he had a sad end to his life. There were financial troubles and so he fled to France where he became a prisoner of war in Paris and where on 29th November 1809 he was hanged aged 41 years. Several pieces of Communion Silver are relatively recent in origin but two date from 1714 and were made by Mr Edward Workman. The chalice, which is 101/2" high and weighs 15ozs., is hallmarked on rim and foot and is inscribed "Church at Garvaghy". The paten is circular and was designed to be a cover for the chalice. They would have been arranged as such during the Eucharist prior to the Offertory and after the communion when the ablutions had been carried out. These two pieces were made in Dublin. Mr Edward Workman was one of the best Irish goldsmiths of his day. He was born in 1678, the son of Richard Workman, a tanner of Portadown. The Workman family was Scottish in origin and seems to have settled in Co. Armagh about 1620. The family seems to have done well financially for they were later able to buy substantial holdings of land in the region of Lurgan and Portadown. The family belonged to Drumcree Parish Church and it was there in the Parish graveyard that Edward's father was buried in 1713. Edward left Portadown in 1693 to become an apprentice goldsmith in Dublin and in 1702 he was sworn in as a Freeman of the Dublin Goldsmith Company. He was later to be Warden of the Company (1704-1711) and was eventually to rise to become its Master in 1712. His first marked piece of work to have survived to the present is a tablespoon, which is currently held in the Holburne Museum, Bath. This dates from 1699. He died in 1719 shortly after being elected as Churchwarden of his Parish Church in Dublin. There are no existing records of the circumstances under which the items of Communion Silver were commissioned and purchased. That a well known and prominent goldsmith was the person given the commission implies that the Parish, recovering as it was from the effects of the war of 1641 and therefore probably quite poor, had a wealthy patron. It is likely but not completely certain that this patron was a member of the Waring family of Waringsford. The acquisition of the high quality Communion Silver was not the only step forward made by the Parish in the decades after the rebuilding of the Church. In 1743 the bell, still in use, was purchased and placed in position. Further developments of a more far-reaching nature took place in 1780 when the Church building was renovated. It was at this time that the Vestry room was built. It is also recorded that the chancel was also reconstructed but there is, however, no record of the nature of the chancel and sanctuary prior to 1780. In the 18th century linen was an increasingly major element in the economy and Garvaghy was no exception. The linen as it came from the loom was a brown colour. Linen drapers, who were often the bleachers or their agents, bought these brown webs of linen from the weavers. The business was carried out weekly at fairs or markets. During the latter part of the 18th century most towns had such brown linen fairs. In the open street or in brown linen halls the drapers agreed a price with each weaver and later in the day measured out the webs and paid the weavers. This method of working often led to allegations of dishonesty and so in 1764 Parliament supported the Linen Board's decision to appoint Sealmasters to inspect the cloth and stamp it if it was of sufficient quality. These brown linen seals were issued by the Irish Linen Board from 1764 to 1823. A stamp gave the weaver's name, the parish or town and the county. There is a surviving seal issued to a weaver named John McMurran of Garvaghy Parish in 1782 and which was valid until 1798. This particular seal was 1 7/8" by 2 3/8" and had an image of a spinning wheel on it. The name, parish and county are all in capitals 1/4" high. Towards the end of the 18th century Ireland moved again towards conflict, a progression which culminated in the fighting of 1798 between the forces of the United Irishmen and those of the Crown. The reasons for this conflict and the details of it are not going to be discussed here, being more than adequately covered elsewhere. The conflict did, however, have a strong local dimension. The battle of Ballynahinch on Wednesday 13th June 1798 with its defeat of the United Irishmen was a turning point of the conflict. The cause of the United Irishmen had a lot of popular support amongst the people of Ballynahinch and the surrounding areas, including the active support of a number of Presbyterian clergy. General Monro led the United Irishmen who advanced on and occupied Ballynahinch. Their first encounter with the Government forces, under the command of General Nugent, was on the evening of 12th June 1798. The United Irishmen withdrew from the town and Windmill Hill to Ednavady Hill. The main battle commenced early the following morning, Wednesday 13th June. The United Irishmen had between 5000 and 7000 troops, 1000 of whom deserted on the eve of the battle. They had eight 1-pounder mounted swivel guns. The Government forces had by contrast between 2000 and 3000 troops, six 6-pounder guns and two howitzers. The result was defeat for the United Irishmen. Claims of casualties of the battle vary from 140 to 500 dead but it has to be remembered that on top of this many United Irishmen were killed in the aftermath of the battle. The Vicar of Garvaghy in 1798 was the Rev Thomas Beatty who worked hard to prevent the excesses that tended to follow a battle from spreading into Garvaghy. Riding his horse he visited those in authority and pleaded for restraint. For his work he was presented with a good horse and the necessary riding items. Some of those killed in the aftermath were the now famous Betsy Gray, her lover and her brother. They had taken part in the Battle of Ballynahinch with Betsy being apparently armed with a pistol. After the defeat they fled along with many others but while trying to cross a river about 1 1/2 miles from Ballynahinch a detachment of the Hillsborough Yeomanry Infantry caught Betsy. The men began to come to her aid but they were killed. Betsy's hand was cut off with a sword in the ensuing struggle after which she was shot in the head. The bodies were later found by friends who then buried them in a shallow grave. Mr James Gray erected a memorial on the site in 1895 but this was destroyed in 1898. A strong and well founded tradition states that Betsy's body was disinterred from the shallow grave when the repercussions of the battle had subsided and that it was re-buried in the graveyard of Garvaghy Parish Church. Some historians maintain that Betsy was born at Six-road-ends, between Newtownards and Bangor, while others insist that she was born in a house on the outskirts of Waringsford, in the townland of Tullyniskey in the Parish of Garvaghy. A John Gray appears on the rental lists of the Waringsford Estate dated 1788 as a holder of 15 acres in the townland of Tullyniskey. The Church registers, since destroyed, recorded that he had married Rebecca Young, daughter of John Young of Tullyniskey, in 1774. It was also recorded in the registers that their daughter Elizabeth was baptised on 14th January 1780. John Gray died in September 1795 and Rebecca in October 1813. Each was buried in Garvaghy Parish Graveyard. Was their daughter Elizabeth the Betsy Gray of the Battle of Ballynahinch? Whatever, therefore, the details of her life and death it does seem certain that Betsy Gray had strong affiliations to the Parish of Garvaghy. In her life and tragic death the Battle of Ballynahinch and the Rising of 1798 in general took on a very individualistic and local feeling. The 18th century had closed with contlict but the 19th century opened with different concerns. It was the era of emigration and the famine, of increasing education and of industrialisation. All of this affected the Parish of Garvaghy and its surrounding area. The first building erected for the celebration of the Liturgy for the Roman Catholic Community of Garvaghy was a Mass Shed in the townland of Ballela. These were difficult times for Roman Catholics but the members of the Church persisted and in 1822 work was commenced on building a Church. This work was commenced by the Very Rev Hugh McConville PPVG, of Dromore, who was assisted by Mr Roger Magennis. It was dedicated All Saints Church. It was later renovated in 1846 by the Rev J Sharkey PP and dedicated by the Most Rev Dr Blake, Bishop of Dromore, on 20th May 1849. It was once again renovated in 1950 under the guidance of the Very Rev James Murray. The rededication was carried out by the Most Rev Dr O'Doherty in September 1950. Bishop O'Doherty presided at High Mass, which was celebrated by the Rev E Devlin. The Deacon was the Rev J Mooney and the Subdeacon was the Rev J McEvoy. The preacher was the Rev Edward Campbell of Newry. In time this Church building was felt to be inadequate for the needs of the Parish and so the decision was taken to erect a new Church building. This building, also dedicated All Saints, was consecrated by his Lordship the Most Rev Gerard Brooks, Bishop of Dromore, on Sunday 9th May 1994. The architect was Felix Forte of McLean and Forte, Malone Road, Belfast. The cost of the project came to �500,000. There had been Presbyterians living in the Parish since the 16th century but they had worshipped before 1713 in Magherally and then later in Dromara. Although the Presbyterians of Garvaghy joined with those of Dromara they retained a separate identity. They paid their part of the Minister's stipend independently and received a separate receipt. This degree of independence was also to be seen on the Communion tokens with the letters D-G being represented. These stand for "Dromara-Garvaghy". A separate congregation of Garvaghy was established later, not because of distance, but because of the strong internal Presbyterian doctrinal disputes of the late 18th and early 19th centuries. In broad terms the Dromara congregation was of the liberal or "New Light' persuasion while the Presbyterians of Garvaghy were of the Secessionist tradition which was essentially conservative and evangelical. On May 14th 1799 the Presbyterians of Garvaghy presented a petition to the Down Secession Presbytery from 61 subscribers requesting someone, `To preach the Gospel amongst them for some Sabbaths'. It was not long before a Congregational Committee was formed and at a Presbytery Meeting held on April 21st 1801 provision was made for determining the boundaries between the new congregation of Garvaghy and those nearby. In January 1803 the Congregation asked for permission to call a Minister and promised a stipend of �38 for the first year and the sum of �40 for each year thereafter. Mr Isaac Allen, of Co. Down, was called to be the first Minister and he was ordained on 2nd November 1803 for the congregation in the field where the Meeting House was to be built. The Meeting House was built in 1803 and opened in 1804. It was on the site of the Presbyterian Graveyard. It was described as a plain building with a thatched roof. Each family paid for the erection of their own pew. The weekly Sabbath service generally lasted three hours and included two sermons and an exposition of a Psalm. The Communion Services lasted for five or six hours, usually though with a break for refreshments. The 1832 Anatomy Act allowed the bodies of paupers in workhouses and hospitals to be taken and used by medical students. Before this change in the law the shortage of bodies meant that graveyards were under threat of being raided and recently buried bodies being dug up to supply this lucrative market. Bodies were of little use once they had begun to decompose and so people would often keep watch for several weeks until the period of risk was over. The main areas in which these grave robbers worked was the east coast of Ireland and especially the east coast of Co Antrim which was close to medical establishments of Glasgow and Edinburgh. Some Churches built a Watch House or Corpse House in which a coffin could be locked for a few weeks until the process of decomposition was well under way. Then the burial could take place safe in the knowledge that the body would be of no use for anatomical purposes. The foundations of such a Watch House may be seen at Garvaghy Parish Church across the path from the west door. What was the interior of the House has become regular grave plots. The practise in Garvaghy would probably have been the same as in other localities in that either relatives of the deceased would have organised a rota to watch or someone would have been paid to do the job. The Rectory was built in 1820 and had 74 acres in its glebe. It was erected for the sum of �800 of which �400 was given as a gift and �400 was borrowed from the Board of First Fruits. After the disestablishment of the Church of Ireland in 1870 the Church Commissioners sold all glebe lands, which were usually set in several small tenancies. The Select Vestry of Garvaghy Parish bought back the Rectory and four (Irish) acres for �700. It was later sold when the Parish of Garvaghy was grouped with the Parish of Dromara in 1885. Some years later it was purchased by the congregation of Garvaghy Presbyterian Church for use as the Manse for its Minister. It was sold again, however, in 1997. In 1834 a survey of Ireland was carried out and Lieutenant G A Bennett made the statistical return for the area of Garvaghy Parish, 29th October 1834. The following is a summary of his report. The Parish is situated partly in the upper and partly in the lower barony of Iveagh with an extreme length of six miles and a width of four miles. The total acreage is not mentioned but he reported that 241 acres were uncultivated and that 25 1/4 acres were lakes. It was pointed out that the River Bann ran through the south-west end of the parish and that a branch of the River Lagan passed through it in the area of Waringsford. There were numerous other smaller streams which were of sufficient volume in winter to power mills but which were dry in the summer. Corbet Lough -partly in Garvaghy Parish and partly in Magherally Parish. Knockgorm Lough -11 acres, in the centre of the townland of that name. On its southern shore is a swamp of 12 acres which before drainage work prior to the 1830s had been part of the Lough. The high bank or island, which had been at the centre of the Lough but �n1834 lay at the southern shore is artificial. Lieutenant G A Bennett reported that there was a possibility of the Lough being drained in the near future. Lough Dugh (or Dhu) - "the Black Lake" is situated in the valley which separates Shanrod from Knockgorm townlands. It was reported that a turf bog surrounded it and that the area to the south was good quality pasture. Lough Kock -also known as Lough Craig. It was reported that this lay one mile north of Lough Dhu. It was overgrown with weeds and was in effect part of Shanrod bog. The OS Returns indicate that the bogs of the Parish supplied fuel to the local residents and the surrounding areas. The largest of the bogs was the Flow Bog, with 32 1/2 acres in the Parish, and the Gall Bog with 57 acres in the Parish. A lot of turf from the latter was sent to Banbridge. It was reported that at some stage prior to 1834 the road through the Gall Bog had been used as a racecourse. In terms of trees the Parish was described as being rather bare. The demesne of Waringsford contained 31 acres of mature trees, principally fir and at Sion Hill there was a small plantation of about 20 years growth. At the east end of Carnew Mr Macreedy's land was planted as was that of Mr Maginnis in Ballyilly. Glebe House (the Rev Mr Hamilton). Each of these houses was, however, described as being plain buildings. The population in 1834 was reported to be mainly Presbyterian and Roman Catholic with the members of the Established (Anglican) Church having the smallest numbers. The houses of the local population were made generally of stone and thatched. There were six schools in the Parish of Garvaghy, one in each of the following townlands -Fedany, Tullyniskey, Shanrod, Carnew, Castlevennon and Corbally. A number of mills were mentioned in the report. There was a large corn mill on a branch of the River Lagan belonging to Mr Hammond. There were also corn and flax mills on a stream between Garvaghy and Fedany, in the south of Shanrod and in Ballyillmore. It was reported that weaving did not prevail to the extent that it did in other areas but that on a small scale it supplemented the income of many small farms. In 1834 Petty Sessions were held in Banbridge and Dromara but there was no resident magistrate. The report of the Ecclesiastical Commissioners in 1836 sheds a little light on some aspects of the Church's presence in the Parish. �37-2-5 on the care of "Foundling and poor persons"
�1 - on whitewashing the houses of the poor in order to prevent cholera. The Church also spent 15s on Communion Elements with an observance being made that the Holy Communion was celebrated four times each year. This was made by Mr J R Ward and refers to the period from December 1836 to July 1837. He supplies a detailed description of the Parish Church, mentions the Presbyterian Church of Garvaghy, remarks on several mills and gives a report on the schools of the Parish. He described the Parish Church of Garvaghy, in the townland of Fedany, as a stone building, rough cast and whitewashed. The report indicates that there was no tower and that the bell was housed in a small erection of masonry over the west gable. The building measured, apart from the porch, 60 Feet in length and 30 feet in width. The condition was described as neat and the aisle was paved with limestone. There were twelve pews which could hold 120 people and Mr Ward reported that the Sunday attendance was easily that number. He also reported that in 1837 the Church building was undergoing repairs and that the estimated cost was �28. This amount was going to be covered by a grant from the Church Commissioners. There is, however, no indication as to the nature of the repairs. Mr Ward mentions very briefly four mills in the Parish. One in Tullyorior, built in 1823, was in a ruinous condition. There were also two in Ballyilly, one of which was built in 1835 while the date of the other is unknown. Tullyniskey also had a mill but the date of it was uncertain as well. The five schools mentioned in the report were at Castlevennon, Tullyorior, Ballooly, Shanrod and Fedany (the Parish School). In the statistics supplied in the report the word Protestant refers only to members of the Established Church of Ireland. This was built in 1829 and was visited by the Vicar of the Parish, the Rev Hugh Hamilton. Those on the roll were, 1 Protestant, 4 Roman Catholics and 30 Presbyterians. The Master was Joshua Moore, a Presbyterian. This was a very small school built in 1829. It was also visited by the Rev Hugh Hamilton. Those on the roll were, 3 Protestants, 7 Presbyterians and 30 Roman Catholics. The Mistress was Elizabeth Downey, a Roman Catholic. Ballooly School was built in 1834 and was visited by the Rev Hugh McConville of the Roman Catholic Church. For religious instruction the Authorised Version of the Bible was used. Those on the roll were, 100 Roman Catholic and 10 Presbyterians. The Mistress was Margaret Watson, a Roman Catholic. This was a thatched building erected in 1828 and was visited by the Rev Hugh Hamilton. Those on the roll were 20 Protestants, 36 Presbyterians and 4 Roman Catholics. The Master was Hugh Piper, a Presbyterian. It is not known exactly when this school was built but from the report given by Mr Ward it would seem to have been in the late 1760s. This was not the building currently used by the Parish as a hall, which was a former school, but on the opposite side of the road outside the boundary of the Churchyard. This school too was visited by the Rev Hugh Hamilton. Those on the roll were 38 Protestants, 182 Presbyterians and 5 Roman Catholics. The Master was James McKeown, a Presbyterian. 1,033 of the Established Church. There were six Sunday Schools, with an enrolment of 245 children, and a total of eight day schools. Of the latter, one was salaried with �8 from the Association for Discounting Vice, and three with �4, �6 and �7 from the London Hibernian Society. The total enrolment of the day schools was 300 boys and 233 girls. In the townland of Shanrod there occurred one of the first public demonstrations in the North of Ireland aimed at putting right the wrongs done to the tenant farmers by some of the landlords. The Rutherford evictions in the townland of Corbett in 1851 provided the spark to set off the demonstrations. The movement, led by Mr William Sharman Crawford and Mr James McKnight, gathered pace and bore fruit in the later Parliamentary measures such as the Land Act of 1881. There was no playground and the school room was reported to be suitable for 75 children. There were 84 children on the roll (38 Protestants, 2 Roman Catholics and 44 Presbyterians) with an average attendance of 42. The Inspector's report states that the school was found to be unsatisfactory. The report also mentions a school built at Carnew in 1827 on lands held with a 99 year lease from Mr. Andrew Cowan. There were 107 children on the roll. Throughout the 19th century the famine and emigration were major features and they left a lasting imprint upon Irish society. The famine came about as a result of over reliance upon the potato crop. It was not that Ireland did not or could not realise pork, beef or dairy produce but that these were largely exported to England. When the potato blight struck in 1845 vast swathes of the population were exposed to risk. In Co Down as a whole there were areas that were acutely affected by the famine while others were relatively untouched. No details are available for the Parish of Garvaghy but the area did come under the jurisdiction of Banbridge as far as the Workhouses were concerned. It was here that people went when all other resources had failed. One example of the pressure on places in the local Workhouses is that in the week ending 20th February 1847 the Banbridge Workhouses held a total of 1,032 people in accommodation designed for 848. The famine, or more correctly famines, resulted in the start of emigration from Ireland to the USA and Australia. This loss of population continued long after the immediate effects of the famine. Below are some population statistics for Co Down illustrating the change. For most of the 19th century fares were �3 to �5 for a passage to North America and �15 to �20 for one to Australia. At the same time the average weekly wage for a labourer was only �1. A Parishioner of Garvaghy who had emigrated to the USA made at least two visits home, one of which was in the late 1860s. In a journal he recorded some of his impressions of the area. One change he remarked on was that standing at the Parish Church at night there were fewer lighted windows to be seen throughout the countryside. The change in population was having a very local effect. The table below illustrates the change in the population of the Parish between 1834 and 1911.